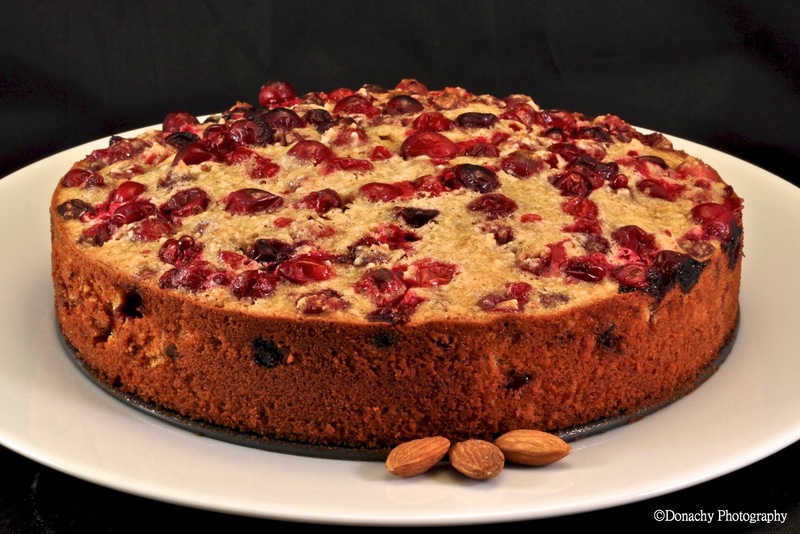 Tart cranberries and almonds make for an irresistible combination. This cake is delicious served with vanilla bean ice cream or covered with hot vanilla custard. With eight weeks to go in our school year, it’s time to get creative with items remaining in our pantry and freezers. Our pecan upside-down pumpkin cake was a delicious way to use up a cup of frozen pumpkin puree that survived the holiday season. Our next challenge was two cups of cranberries from the freezer door. I found a promising recipe for a crustless cranberry “pie.” We are fans of tart and sweet flavor combinations, and this recipe was a terrific way to use those residual cranberries. I decided to pulverize the almonds so they would provide more flavor than texture. Preheat oven to 350 degrees F. Grease one deep 9-inch pie pan. Combine the flour, sugar, and salt. Stir in the cranberries and the almonds, and toss to coat. Stir in the applesauce, beaten eggs, and almond extract. The mixture will be very thick. Spread the batter into the greased pan. Bake at 350 degrees F for 40 minutes, or until a wooden pick inserted near the center comes out clean. Serve warm with whipped cream, ice cream, or warm vanilla custard.